Hey guys. Since I'm studyin' about 100km from home and I'm traveling with bus or train I have a little problem transporting the uni. I would appreciate if you could share with me some of your tips and your ideas... I tryed to fix it on my backpack... but It's a little bit to heavy and too big (I have a 20" trial Qu-Ax). I just got a qu axe back pack, one shoulder strap broke the first time I put it on, the stitching is weak. I'm waiting on a replacement, and I'll reinforce the stitching. I've used it with 1 strap and it seems to hold. Funny, the site I ordered it from said they will no longer stock it. Maybe I'm not the only one. The design is nice, though. I use a normal bagpack. I only need two keychains to fix my 20" unicycle. 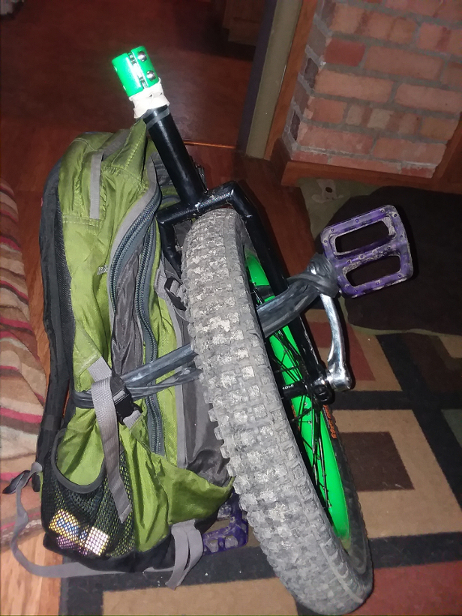 I Fix the keychains on the sides of the bagpack and put them through on handle, then I put it over the wheel (the seatpost has to be between the keychains). Then I stick it through another Handle (I think you can also use the same again) and fix it at the spokes of the unicycle. The uni fits very well on the luggage rack (up to 24/26"). On the bus it's a little bit more tricky but even there I never had any problems storing it. To get on and of I alwas have the uni in front and the suitcase behind me. I prefer not having it strapped on to something or in an extra bag as it's way more flexible this way. It's also my most favourite toy to play around with while waiting for the train/bus to come. Another good thing: When I'm late (because of a delay) I can hop on and ride to the next platform. I like the inner tube idea! Thanks for sharing. There are several thread on different bags that can be used. John Foss uses a inexpensive bag that can be bought via eBay. I use a backpack type bag that was created for coupled bikes. Sewing a simple bag out of Cordura is another option. Ikea has a useful bag called DIMPA. I think you can get similar ones via Amazon. Perhaps a 20" can fit in the FRAKTA. Last edited by Vertigo; 2017-11-26 at 09:03 PM. I have a B&W International Foldon bag which I use for flying with my 26". Plenty of room for the disassembled uni, a backpack, protective gear and clothes. I carried my helmet separately but it would probably fit too. I fitted a piece of 3mm MDF inside the base and a sheet of 3mm coreflute for each side to make it hold its shape better. I also added casters to the bottom (riveted to the MDF through the fabric). The one thing I would mention if anyone's going to be chucking their saddle and seatpost into their bag a lot, is that I always tighten the clamp down a little bit so it doesn't fall off (you could take it all the way off,) but it makes getting the post back in sometimes a little harder. If you don't want it to look like Zorro has claimed your seatpost, make sure you deburr the inside of the seat tube slot. Not removing said saddle and post would be one advantage of a big duffel or mesh bag; you could just throw the whole uni in and go, but it might be a little more unwieldy, as well. Honestly the first thing that came to mind was a wheeled hockey goalie bag, but surprisingly, I prefer carrying my gear on my back (my favorite was a Patagonia Black Hole duffel bag that I stole from my dad--I used to ride with my whole wardrobe in it to the laundromat in college, then it became my hockey bag, and it's bombproof and still holding on.) I will see how it works for uni-transport when I get the chance.